Scientific name: Capsicum annuum L.
Unlike their fellow capsicum members, sweet peppers characteristically have a bell shape, and crunchy, thick fleshy textured pod. On comparison with fellow chili-pepper members, bell (sweet) peppers feature dramatically less pungency that ranges from zero to very minimal on the hotness scale. For the same reasons, they treated much like any other day-to-day vegetables instead of spices in the cuisine. Peppers are native to Mexico and other Central American region, from where they spread to the rest of the world through the Spanish and Portuguese explorers during 16th and 17th centuries. Today, they are grown widely in many parts of the world as an important commercial crop. As in other chili pepper varieties, bell peppers also have several cultivar types. However, their plant type and fruit pod (with 3-5 lobes) are common hallmarks in almost all cultivars. In structure, sweet pepper features blocky, cube-like outer flesh enveloping around many tiny, cream colored, round and flat seeds. The seeds are clinging on to the central core (placenta). For harvesting, peppers are handpicked at different stages of maturity depending on the preferences of local markets. All varieties of young, immature peppers feature green color pods, irrespective of their final destined color. As the fruit matures, it gradually acquires its true genetic color; orange, red, purple, yellow, and green. The hotness of peppers is measured in Scoville heat units(SHU). On the Scoville scale, a sweet bell pepper scores 0, while a jalapeno pepper around 2,500-4,000, and a Mexican habanero- 200,000 to 500,000 units. 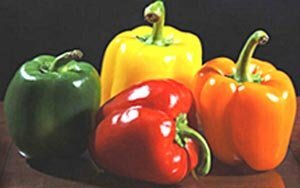 Fresh bell peppers can be readily available in he markets year round. Buy fresh harvest featuring firm, bright fruits feeling heavy for their size. Avoid excessively soft, lusterless, pale green color peppers. Furthermore, avoid those with surface cuts/punctures, bruise, spots and shriveled stems. Once at home, they should be kept in the refrigerator in a plastic bag where they stay fresh for about 3-4 days. They may sustain chill injuries if stored for extended periods. In general, fresh bell peppers are treated just like any other vegetables in the kitchen. Their firm, crunchy texture together with delicate sweet flavor makes them one of the most sought after vegetables for cooking. To prepare, wash bell peppers in cold running water. Cut the stem end and discard it. This way, you can see its inside structure. Remove central core with seeds. Now you have a hollow "cup shape" pepper. Chop it using a paring knife into cubes, rings or strips as in onions. Although sweet peppers have the least capsaicin levels unlike other chili peppers, still they may inflict burning sensation to hands and may cause irritation to mouth/nasal passages, eyes and throat. Therefore, it may be advised in some sensitive individuals to use thin, hand gloves and face masks while handling them. Fresh raw bell peppers are being used as vegetables in cuisine. They can be eaten raw in salads or cooked in stir-fries. In many parts of South Asia, they mixed with other vegetables like potato (aloo-simla mirch), carrots, aubergine, green beans, etc., along with tomato, garlic, onion, mustard seeds, cumin, and other spices in various mouth-watering stir-fries (sabzi). They can also be stuffed with rice, meat, cheddar cheese, dried fruits, nuts, etc., and, then cooked/roasted. They can also be grilled and served with sauce, cheese, and olive oil or with dips. Grilled peppers employed in delicious chickpeas (boiled garbanzo beans) salad with cucumber, tomatoes, scallions, pine nuts. Finely chopped sweet peppers can be used in Chinese-style vegetable stir-fries and noodles. Sweet peppers are one of the popular ingredients in Italian pizza and pasta. The pungency level in bell peppers is almost zero 'Scoville heat units (SHU)'. However, their seeds and central core may contain some amount of capsaicin, which when eaten may cause severe irritation and hot sensation to mouth, tongue, and throat. Avoid touching eyes with pepper contaminated fingers. If done so, rinse eyes thoroughly with cold water to reduce irritation. They may aggravate underlying gastroesophageal reflux (GER) condition. (Medical disclaimer). <<-Back to Vegetables from Bell pepper. Visit here for impressive list of vegetables with complete illustrations of their nutrition facts, medicinal properties, and health benefits.